This summer, I took my kids to see the movie Inside Out and my former elementary school counselor completely geeked out! If you haven’t seen it yet, go! Inside Out is a movie that anthropomorphizes the emotions inside a child’s brain and is an excellent parent-child conversation starter on how to handle emotions. Teaching kids (and adults) how to recognize and cope effectively with feelings continues to be a passion of mine–second only to decorating. Managing feelings is tough business, isn’t it? All we have to do is drive during rush hour, or watch the comments section on any public social media post to see that many adults could use a refresher course on how to improve manners, social skills, and coping skills! So how do we help kids manage anger when we sometimes fail miserably at it ourselves? Well, practice might not make perfect but it definitely creates change! If we begin teaching and practicing alternate coping skills when anger strikes, we are bound to improve our skills and help our kids improve theirs. 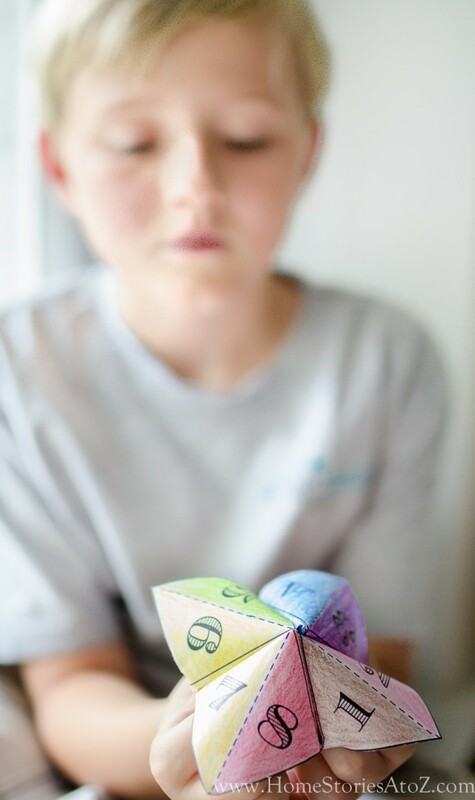 Today, I’m going to show you a fun way to teach your kids anger management strategies that are practical–and more importantly that work! Learning how to help kids manage anger at an early age is a predictor of future life success. Just this month, researches at Penn State released the results of a 20 year study that tracked the role of social skills in children. What they found was that kids with good social skills in kindergarten were more likely to be successful in adulthood (as shown in the areas of education, employment, criminal activity, mental health, and use of public services). What’s exciting and hopeful about these results is that social skills can be learned and improved upon! Our personality and life circumstances might significantly influence how we react to that person who doesn’t know how to drive–or that dirty tissue in someone’s pocket that somehow made it through the wash, Lord Have Mercy!–but our feelings do NOT have to control us. We are in control of our choices, and we get to decide how our feelings will impact our words, thoughts, and behavior. And that, my friends, is powerful stuff! Click here to download the free PDF Anger Catcher worksheet ON A DESKTOP. PRINTING FROM MOBILE MAY NOT BE AN OPTION. 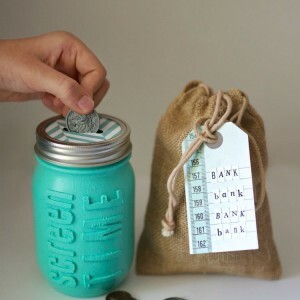 One fun activity I would do with kids as an elementary school counselor is make anger catchers. I made up this worksheet in PicMonkey and Word based off of my memory of a printable I used to own. This free printable is for personal use only. 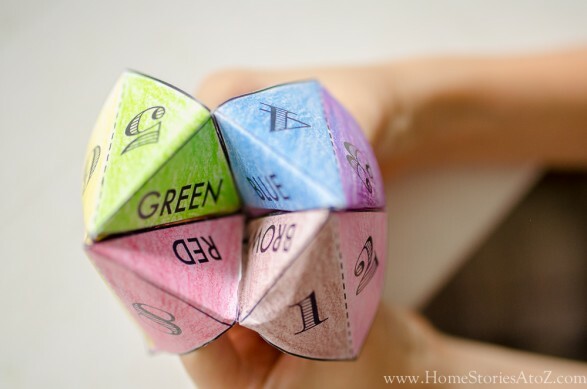 Do you remember cootie catchers? This printable uses the same format–but instead of finding out who is going to give you cooties, you get to learn eight different strategies to help you cope with anger! That is so much better than getting cooties! Step 1: Download the anger catcher and print out. 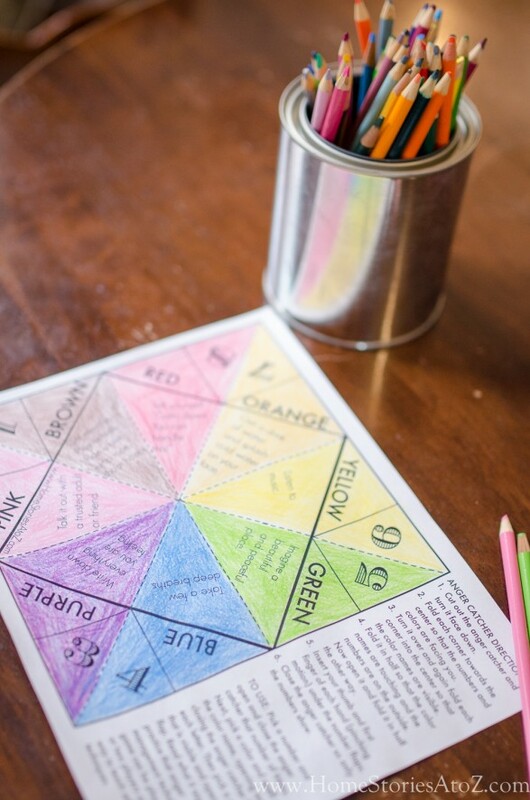 Have your kiddo color the triangles. 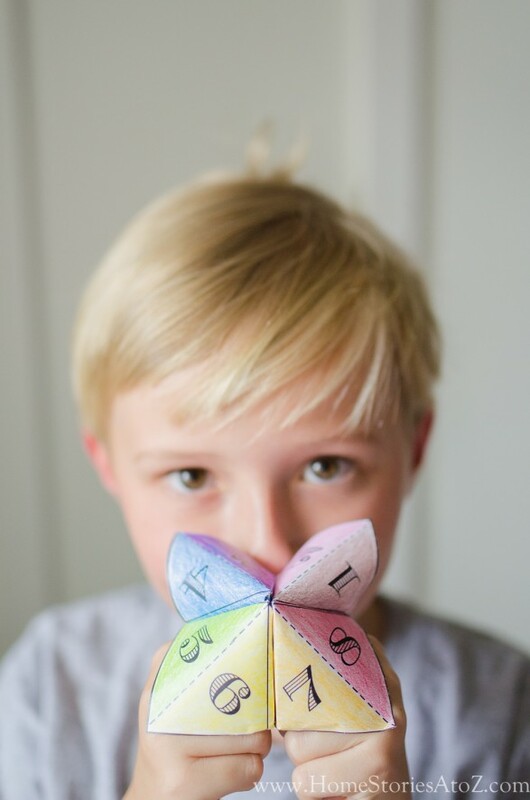 The directions are on the worksheet for you, but I’ll give some pictures below to help answer any questions on how to make your anger catcher. 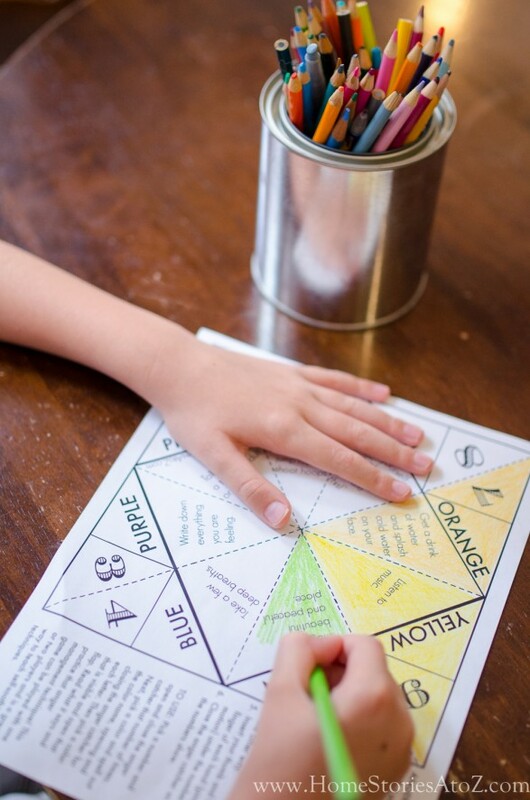 If your kiddo is currently angry, handing them this worksheet and having them color it in can sometimes be calming and soothing. Cut out the anger catcher once colored and place face down. Step 2: Fold each corner towards the center so that the numbers and colors are facing you. 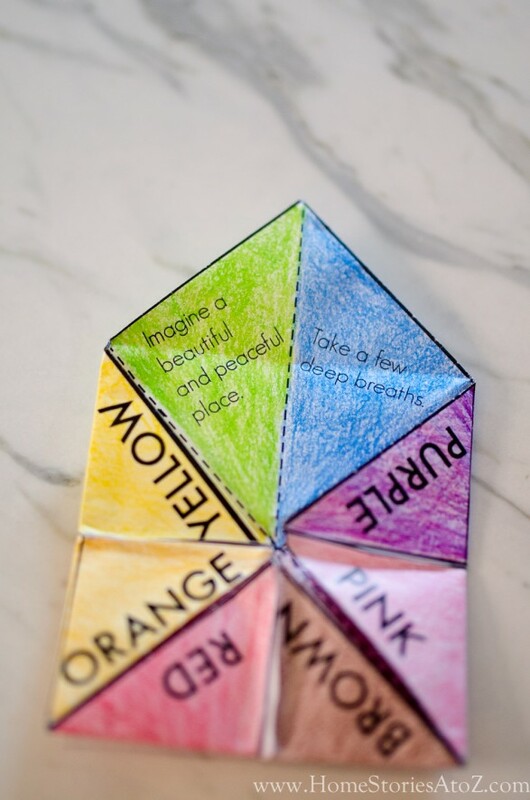 Step 3: Turn it over and again fold each corner into the center so that the color names are visible. 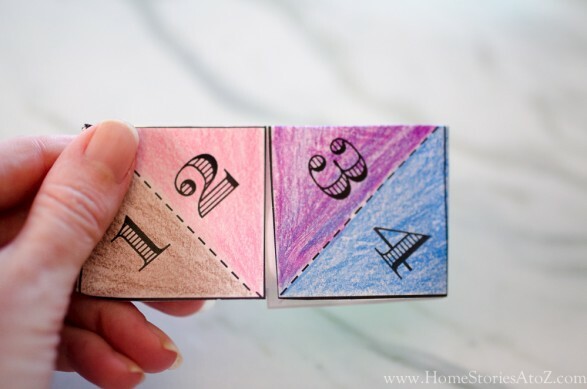 Step 4: Fold it in half so that the color names are touching and the numbers are on the outside. Now open it and fold it in half the other way. Step 5: Insert your thumb and first finger of each hand (pinching motion) under the number flaps. Step 6: Close the anger catcher so only the numbers show. 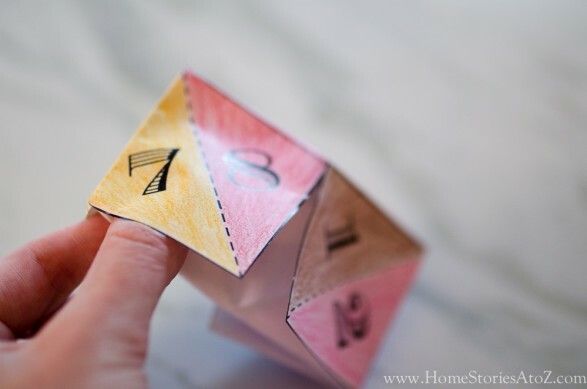 HOW TO USE: Pick a number and open and close the anger catcher that number of times. 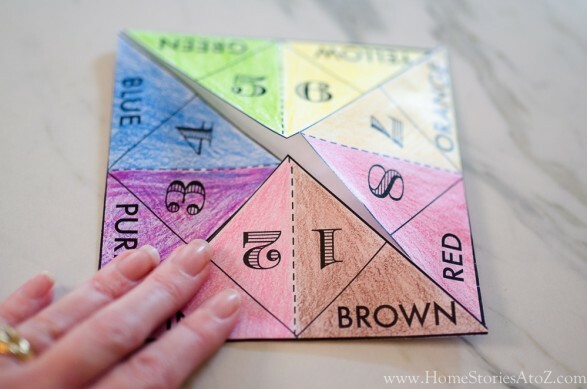 Next, pick a color and spell out the color name, opening and closing the anger catcher for each letter. Then pick a color that is visible and open that flap. Read what it says and practice that anger management technique! This game can be played with one or two players and is a great way to teach self-soothing techniques. If you liked this post, you might also like my related posts as well. I was looking for a fun and creative mental health group idea. Thank you for sharing this. I can’t wait to use this in my group tomorrow. I think it will be a big hit. Thank you for this!! 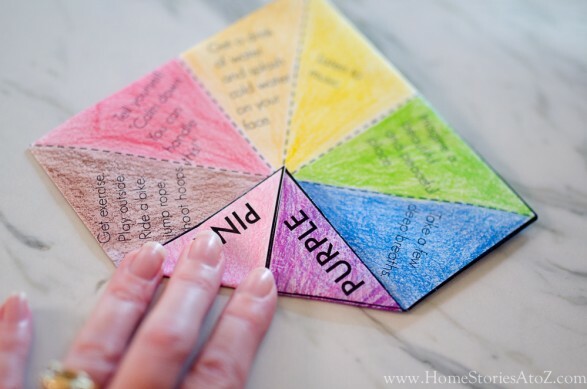 I am editing this to have the four colors of the “zones of regulation” and their strategies! I’m just cutting and pasting then re-copying. I love this!! I am really looking forward to trying this with my son. He is aware of the feeling of “anger” and states when he is angry but doesn’t know how to channel his anger into exploring the feeling. I am so excited to help him with the help of this download! Thank you so much! I am interested in this concept. I don’t see where I can download the Anger Catcher. When I go to print it all, it prints it on two pages. Next to “Step 1” there is a live link (words that are in blue) that you click on. It opens a new tab and you should be able to print this out on one page. Let me know if you’re still having trouble and I’ll see what I can do to help. This is so wonderful for my 3rd grader. We want to have her classmates make them but we’d like to edit it a bit. Any chance you have an editable version ? I’m glad you like it! I don’t have an editable version to share at the moment. Love this! 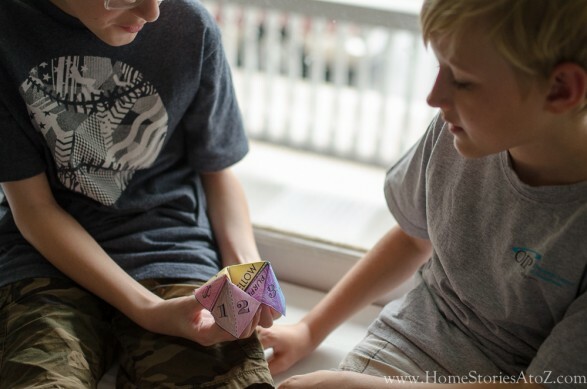 Thank you for sharing your new twist on an old, fun child-centered activity! I always use coloring, drawing and/or sandtray to help students self-soothe, but this makes it an even more productive tool so they walk away with a product they can use over and over. I think it’d be great to have students make at the end of a unit of emotional management; if there are some blanks they could even add some of their own techniques. Thank you!